Exercise your body, not your wallet. Home » In the Media » Exercise your body, not your wallet. In this article Mary is interviewed by one of our very own ‘Running Chicks’ Emma Kennedy about the how popular exercising outdoors is and how the move is now away from gyms. Who better to quote on this one than the founder of Forget The Gym, Mary Jennings. 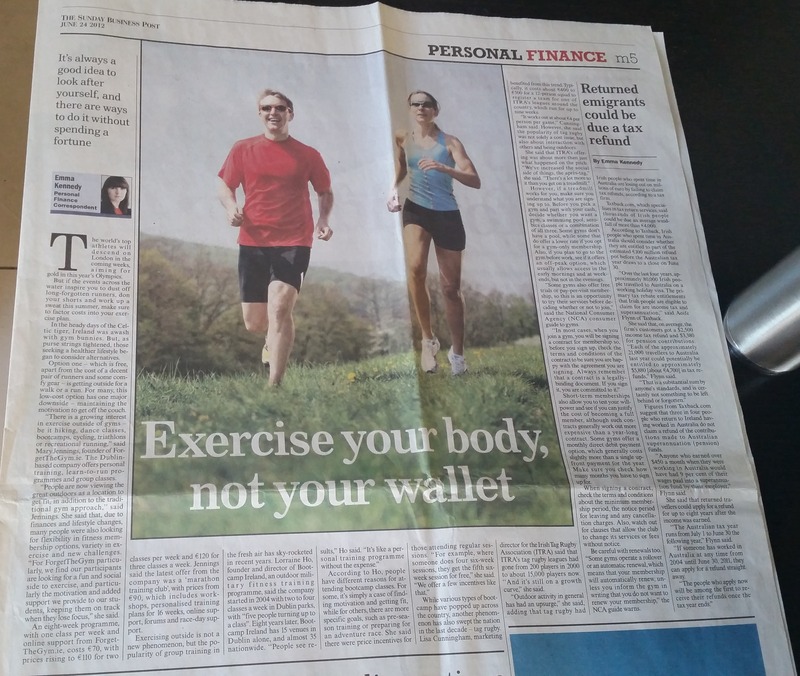 This article first appeared in the Personal Finance section of The Sunday Business Post in June 2012. As this article is only available in premium content please see text below . It’s always a good idea to look after yourself, and there are ways to do it without spending a fortune, writes Emma Kennedy. The world’s top athletes will descend on London in the coming weeks, aiming for gold in this year’s Olympics. But if the events across the water inspire you to dust off long-forgotten runners, don your shorts and work up a sweat this summer, make sure to factor costs into your exercise plan. In the heady days of the Celtic tiger, Ireland was awash with gym bunnies. But, as purse strings tightened, those seeking a healthier lifestyle began to consider alternatives. Option one – which is free, apart from the cost of a decent pair of runners and some comfy gear – is getting outside for a walk or a run. For many, this low-cost option has one major downside – maintaining the motivation to get off the couch. “There is a growing interest in exercise outside of gyms – be it hiking, dance classes, bootcamps, cycling, triathlons or recreational running,” said Mary Jennings, founder of ForgetTheGym.ie. The Dublin-based company offers personal training, learn-to-run programmes and group classes. “People are now viewing the great outdoors as a location to get fit, in addition to the traditional gym approach,” said Jennings. She said that, due to finances and lifestyle changes, many people were also looking for flexibility in fitness membership options, variety in exercise and new challenges. “For ForgetTheGym particularly, we find our participants are looking for a fun and social side to exercise, and particularly the motivation and added support we provide to our students, keeping them on track when they lose focus,” she said. An eight-week programme, with one class per week and online support from ForgetTheGym.ie, costs €70, with prices rising to €110 for two classes per week and €120 for three classes a week. Jennings said the latest offer from the company was a ‘marathon training club’, with prices from €90, which includes workshops, personalised training plans for 16 weeks, online support, forums and race-day support. While various types of bootcamp have popped up across the country, another phenomenon has also swept the nation in the last decade – tag rugby. Lisa Cunningham, marketing director for the Irish Tag Rugby Association (ITRA) said that ITRA’s tag rugby leagues had gone from 200 players in 2000 to about 15,000 players now. “And it’s still on a growth curve,” she said. “Outdoor activity in general has had an upsurge,” she said, adding that tag rugby had benefited from this trend. Typically, it costs about €400 to €500 for a 12-person squad to register a team for one of ITRA’s leagues around the country, which run for up to nine weeks. “It works out at about €4 per person per game,” Cunningham said. However, she said the popularity of tag rugby was not solely a cost issue, but also about interaction with others and being outdoors. However, if a treadmill works for you, make sure you understand what you are signing up to. Before you pick a gym and part with your cash, decide whether you want a gym, a swimming pool, aerobics classes or a combination of all three. Some gyms don’t have a pool, while some that do offer a lower rate if you opt for a gym-only membership. Also, if you plan to go to the gym before work, see if it offers an off-peak option, which usually allows access in the early mornings and at weekends, but not in the evenings. “Some gyms also offer free trials or pay-per-visit membership, so this is an opportunity to try their services before deciding whether or not to join,” said the National Consumer Agency (NCA) consumer guide to gyms. Short-term memberships also allow you to test your willpower and see if you can justify the cost of becoming a full member, although such contracts generally work out more expensive than a year-long contract. Some gyms offer a monthly direct debit payment option, which generally costs slightly more than a single upfront payment for the year. Make sure you check how many months you have to sign up for. When signing a contract, check the terms and conditions about the minimum membership period, the notice period for leaving and any cancellation charges. Also, watch out for clauses that allow the club to change its services or fees without notice. Be careful with renewals too. “Some gyms operate a rollover or an automatic renewal, which means that your membership will automatically renew, unless you inform the gym in writing that you do not want to renew your membership,” the NCA guide warns.